Monster targets DJs and musicians with its NCredible N-Pulse headphones | What Hi-Fi? 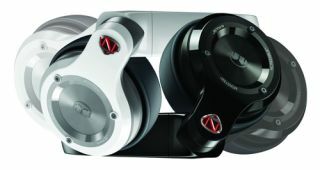 Monster designed its new NCredible N-Pulse over-ear headphones with DJs and semi-professional musicians in mind. Retailing at €230 (£195), they'll make their debut at this year's Musikmesse trade fair in Frankfurt during April. The large hinge joints on the N-Pulse are designed to withstand tough use from DJs, and the ear cups are made from brushed metal for similar reasons. They're available in Midnight Black and Frost White. Also on show in Frankfurt are the Monster N-Tune on-ear headphones (above) and N-Ergy in-ear models (below), the latter available in five different colours. All the Monster NCredible headphones were developed as part of the joint venture between Monster and NCredible Entertainment, the company owned by US TV star Nick Cannon.